Smart Cities are envisioned to offer its citizens a plethora of services that are aimed at optimizing the use of public assets and improving the quality/efficiency of the regular activities. The performance of these services are reliant on the inter-networking of information between the different and disjointed systems with overlapping purposes. The information exchange process will likely involve the communication of large volumes of data with a range of complex requirements that are application-specific. 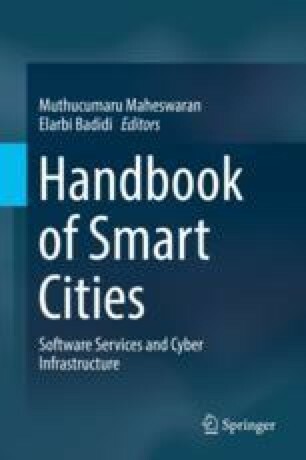 In this chapter, the role of the 5G systems and Internet of Things (IoT) for meeting such stringent requirements are discussed along with the essential constituents of a successful Smart City infrastructure. This research is partly funded by the Advanced Sensor Networks SARChI Chair program, co-hosted by University of Pretoria (UP) and Council for Scientific and Industrial Research (CSIR), through the National Research Foundation (NRF) of South Africa. “The Internet of Things [Infographic],” https://blogs.cisco.com/diversity/the-internet-of-things-infographic, 2011. “Cisco Visual Networking Index: Global Mobile Data Traffic Forecast Update, 2016–2021 White Paper,” https://www.cisco.com/c/en/us/solutions/collateral/service-provider/visual-networking-index-vni/mobile-white-paper-c11-520862.html, February 2017. Statista, “Number of mobile phone users worldwide from 2013 to 2019,” [http://www.statista.com/statistics/274774/forecast-of-mobile-phone-usersworldwide/], 2016.